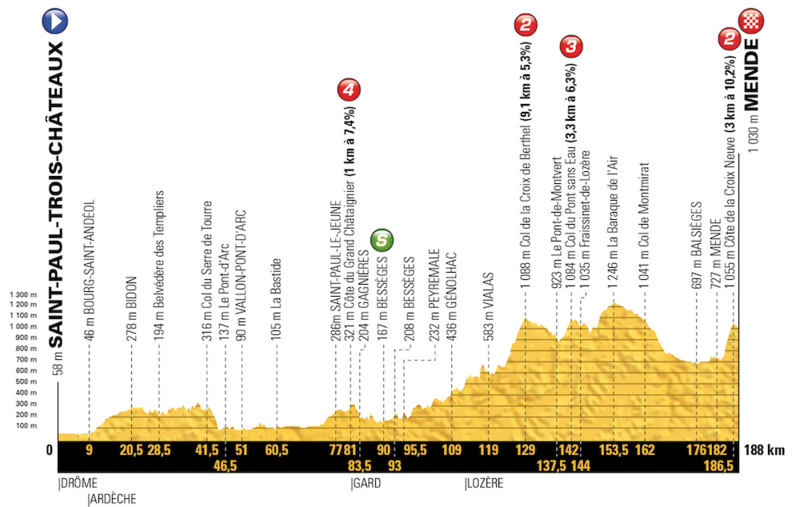 A quick look at each of the Tour de France stages. If there’s a theme to this year’s route it’s variety with short stages, long ones, sprints, cobbles, new summit finishes and more. A long stage and the first half runs along the Atlantic coast. It’s a summer’s day it’ll be tense but if it’s wet and windy it could be a very fraught day. A sprint royale awaits among the best sprinters finally reunited in one race with the hallowed yellow jersey waiting for the winner. 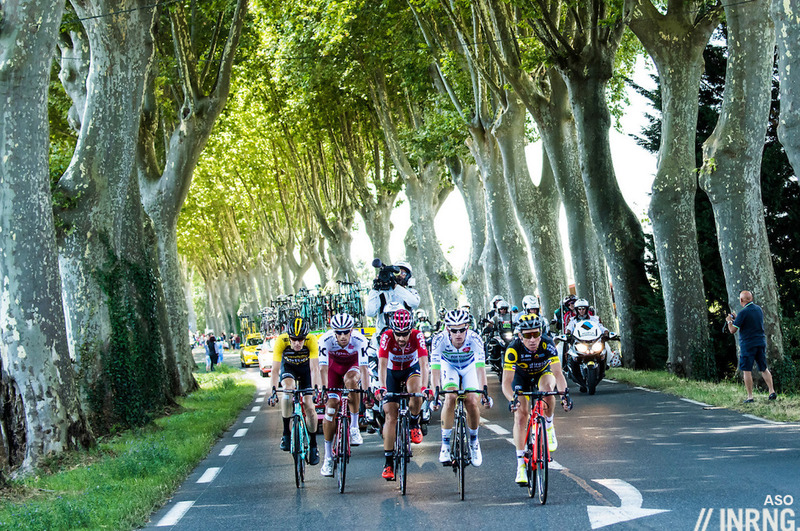 One for the sprinters as the Tour borrows roads from smaller French races like the Chrono des Herbiers and the Tour de Vendée. 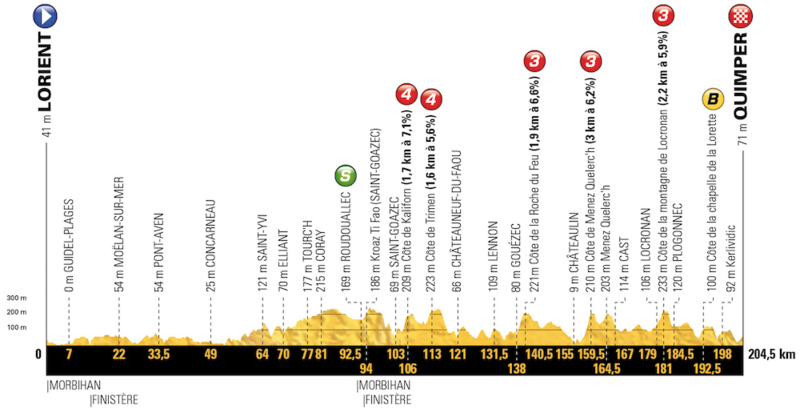 A 35km team time trial to shape the general classification rather than set it in stone but the recent Critérium du Dauphiné will be on the mind. It’s all on rolling roads to suit the most powerful of teams. 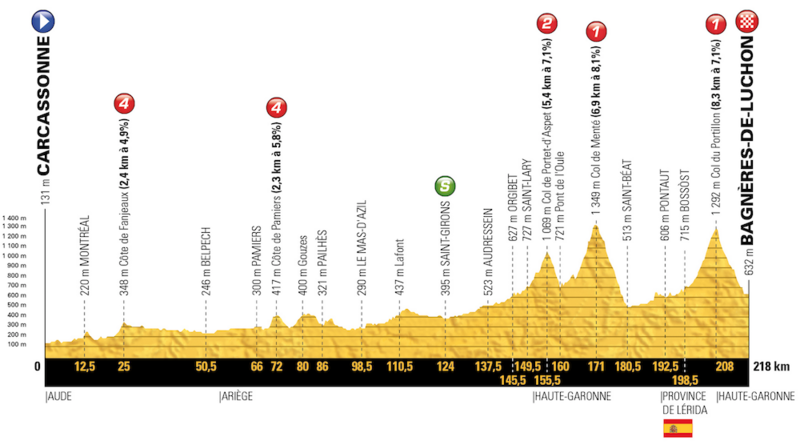 195km and almost an out-and-back course the starts on the coast before looping back, and all on the roads of cycling-mad Brittany so expect huge crowds whatever the weather. Game over for the sprinters with a hard stage across the western point of Brittany. Even if the weather is clement this is a hard day with a rough and tough finish on small roads and sharp climbs and even a few cobbles en route. The overall contenders will have a busy day here. The race returns to Mûr-de-Bretagne and its tricky uphill finish, this time climbed twice in the finish. For sticklers note the stage finishes at Mûr, rather than on because it is a town rather than a “wall” climb. A sprint on Friday 13th, what could go wrong? Actually in France it’s a lucky day when lottery sales boom and this is longest stage of the race. 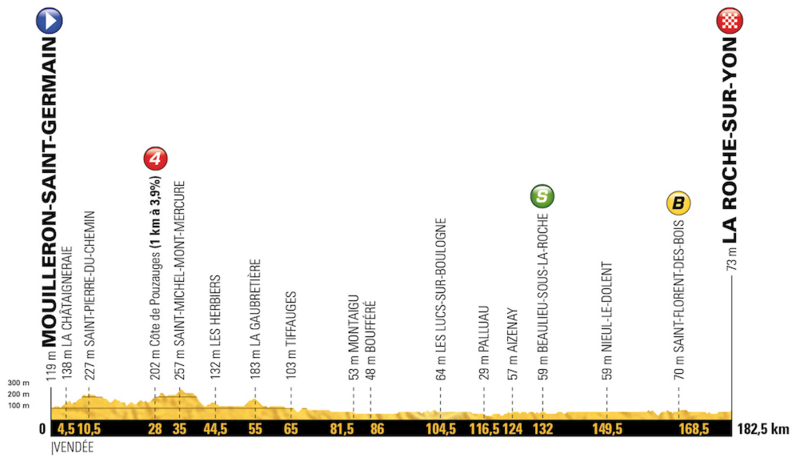 The stage passes to the West of Paris and the Seine valley before heading north to the Somme and a flat finish in Amiens on Bastille Day. 15 cobbled sectors including many from Paris-Roubaix. 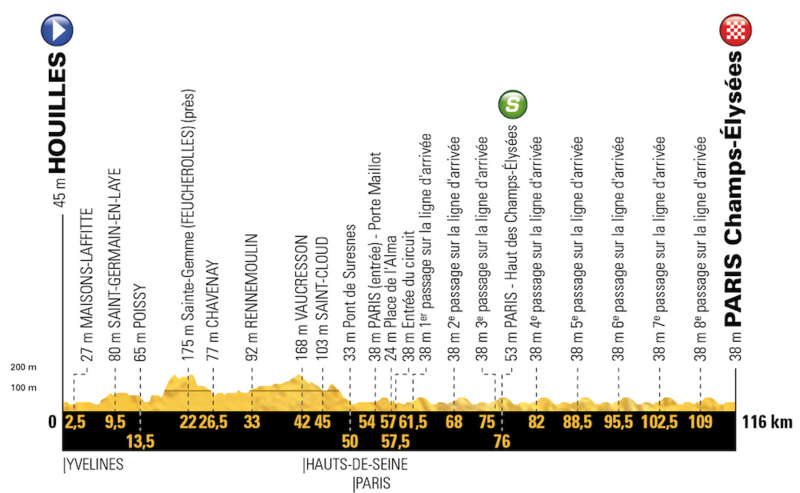 If they’ve trimmed the hardest sections, for example Mons-en-Pévèle is reduced from 3,000 to 900m it’s still plenty and much more than the usual handful of sectors borrowed when the Tour has ventured onto the pavé before, the last 100km are going to be hectic. A rest day and then a brutal change in rhythm from the cobbles to the cols and a hard stage complete with the Plateau de Glières, hyped because of its gravel section, hard because of the climb to get there. Then a tough finish awaits with the “col” de Romme and the Colombière before a fast descent to the finish. An air of déjà vu with the same route as June’s Critérium du Dauphiné stage won by Pello Bilbao and at just 108km an attack fest to watch from start to finish to enjoy the sport and the scenery. A classic day in the Alps with the Madeleine, the Croix de Fer and then the famous hairpins of Alpe d’Huez and the packed crowds. The peloton turns its back to the Alps to the delight of the sprinters although they’ll need to watch out for the Monts du Matin, the chain of hills late on as there are some long ascents to expose anyone who has come out of the Alps with heavy legs and there’s a chance the Mistral wind gets up too. A day for the breakaways, this is mid-mountain stage complete with the tough finish of the Croix Neuve to the Mende aerodrome. Another day for the breakaways via the Montagne Noire before a finish in the Disney-style medieval city of Carcassonne. Watch out for the wind in the final too, the vent d’Autan, did plenty of damage in the recent Route d’Occitanie race. The plains and then the Pyrenees with three sharp climbs and a trip into Spain before a downhill finish into Bagnères-de-Luchon. Three climbs but arguably the descents are the significant points as they’re twisty and treacherous. Just 65km but 3,200m of vertical gain. Uphill from the start and with three hard climbs including the first ever summit finish on the Col du Portet high above Pla d’Adet where the gravel track has been resurfaced for the race to enable this high altitude finish. A gourmet’s delight as the race passes many sources of gastronomic delight but it’s energy bars and gels for the riders before a sprint in Pau. A big day in the Pyrenees with plenty of climbing and descending, including the fast drop into the finish in Laruns at the foot of the Aubisque and past a vulture sanctuary, a warning for any nervous descenders although the route is subject to change given recent flood damage and there may not be time to complete the repairs. A time trial around the Basque Country and much harder than the profile suggests, this is as much a test of freshness as it is power and pacing. There’s barely a metre of flat road, the descents twist and turn and the final climb of the Pinodieta is a steep wall. It’s still a course for a time trial bike but the riders will need to consider what gears to use and it suits the GC contenders much more than the pure TT specialists. A parade that mutates into a criterium but and just 116km. After a suburban start past the dormitory suburbs of Paris the race heads for the swanky Saint Cloud and then the glories of central Paris and the evening finish on the Champs Elysées. 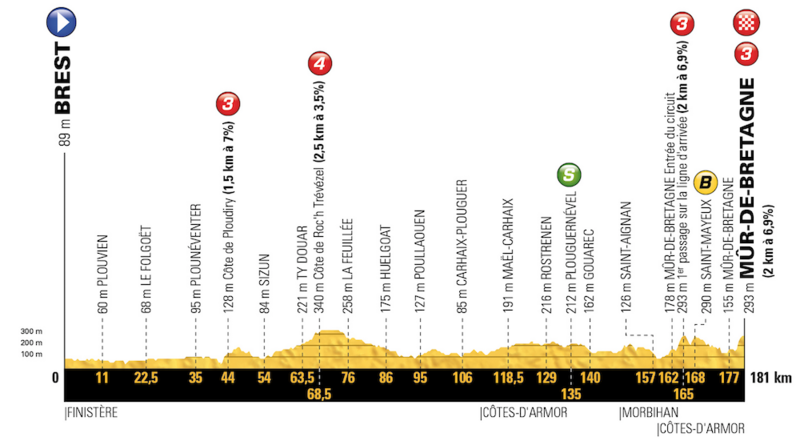 The first 8 stages look potentially a bit of snooze fest unless it’s windy. Stage 9 should make up for it though! Everytime a snooze-fest is predicted, something unpredictable occurs. 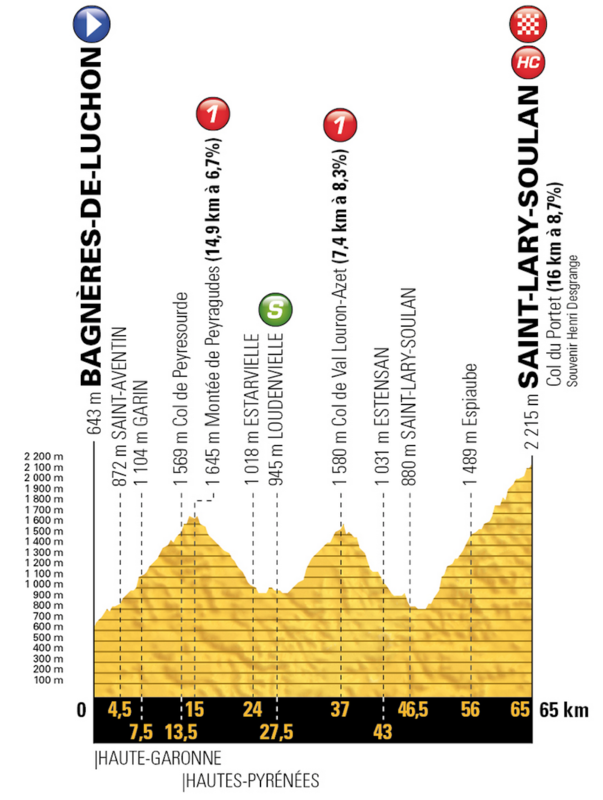 Have a feeling Stage 9 will be it for Richie and a lot of the smaller climbing oriented GC riders. Would love to see a guy bigger guy that can climb a bit put huge time into the field here. Don’t know who, Gilbert comes to mind but not sure if he is even riding it. 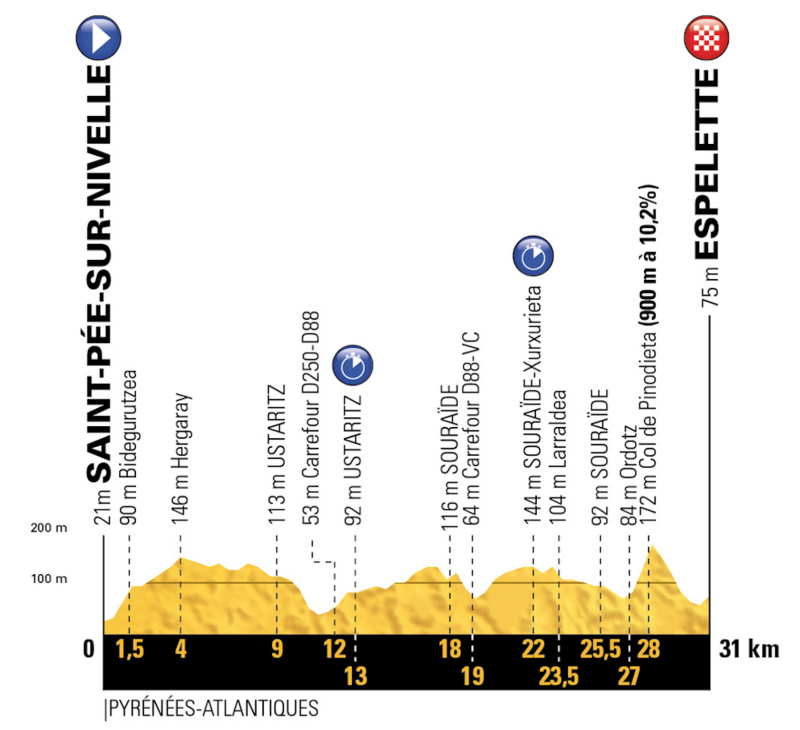 The first week has some good stages, like the Finistère one. The sprints will be good too but watch the forecast – or the daily previews here – because it pays to ration TV viewing during this week, surely only hospital patients in traction who can’t reach the remote would watch all of these stages from start to finish. My mind immediately imagined Richie Porte screaming for a nurse to turn the TV off for some reason. 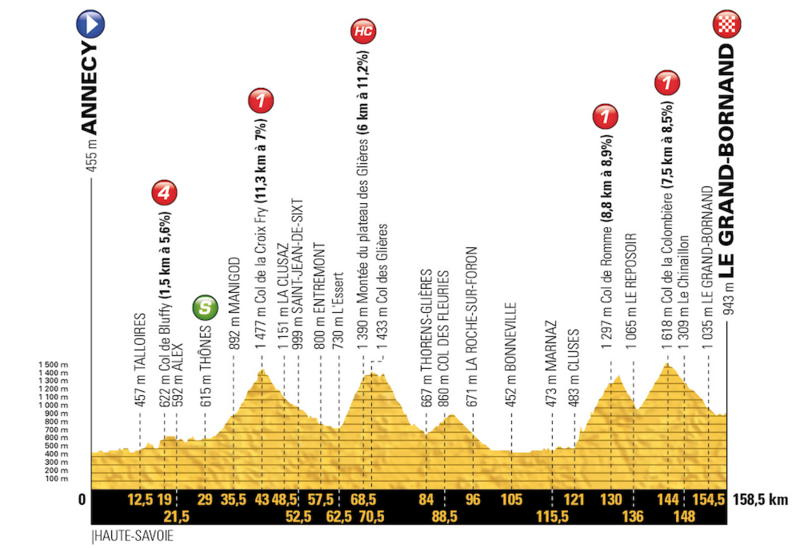 Wonder if they’ll give the sprinters leeway on the timecut for stage 17, because the climbers are gojng to go all out on that. Also I don’t understand the flat stage 18 to Pay nestled into the final week. That will be a procession for the most part. The GC riders will use it to recover. The tour has suffered in the last couple of years from extremely slow flat stages with only one or two guys up the road. Think I read – probably here – that they’re going to be allowed 25%(? ), same as in an ITT. I’m a bit underwhelmed by the look of the weekend stages (when I’ll actually get a chance to watch it all). Stage 9 obviously has potential but other than that they don’t look likely to have a big impact on GC. Well, maybe the TT will but I don’t find them a great spectacle. I’m looking forward to the novelty grid start stage 17. I’ve really come to enjoy the Tour mixing it up with these brutal short mountain stages and this one can be prticularly messy. Of course, the cobbled stage will be very entertaining. I just hope that we don’t have any GC contenders eliminated due to crashes. Time losses, yes, but would like to see everyone in one piece at the end pf the day. A parcours made for those who like to trip over things. Survival will be the name of the game and not making mistakes. Its stupid to say because it always true but consistency and keeping your wits about you will be the key here. 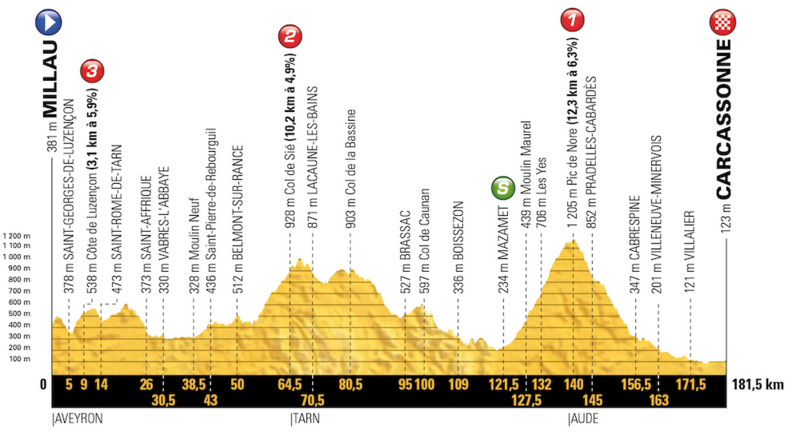 The strongest team will prevail on this course RonDe, I’d look at it? I’m sure that the Team Sky riders will be looking at this and thinking that Movistar and the rest can be put under massive pressure, particularly away from the mountains. And especially if the wind gets up. Good points Ecky, especially when I read Unzue in the press saying his trident gives him a big advantage. Let’s see what happens if and when any cracks appear. I’d take a bet a Movistar rider is NOT the winner. Final decisive stage being a TT is a massive snoozefest. I’m not saying they don’t have a place (giro showed looming TT can have a fantastic impact on road stages) but let’s keep it midweek, eh? For my liking, there are too many flat sprint stages (8) and not enough for puncheur/classics-style riders (3 if you include the cobbles). And a lack of medium mountain stages (1). Surely, few people find the latter two less interesting to watch than the first. Stage 19 doesn’t look like it’s going to change much and with the flat stage before it the end of the Tour could be a bit of a damp squib. 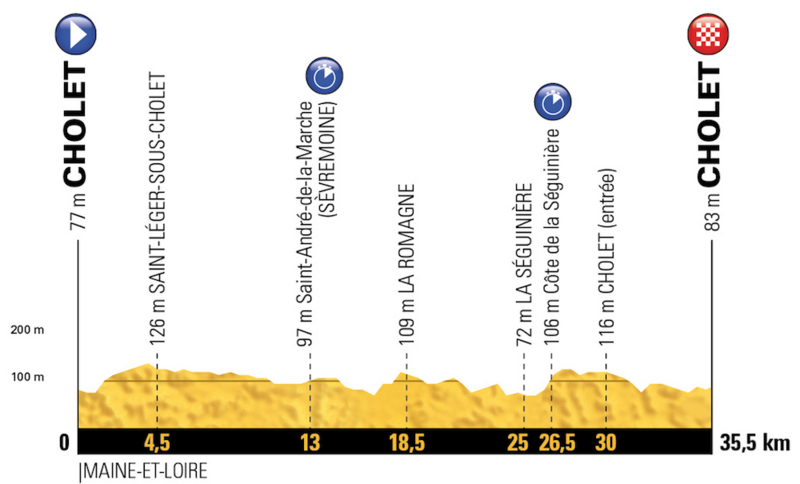 As with every year, I’d liked to have seen a stage over 220km with multiple large climbs – if it’s the ultimate test there should be one stage like this. (At least there are fewer mono-climbs.) As Gabriele often points out, these types of stages get the highest viewing figures, despite the current dogma that short stages are more exciting. Good to see the cobbles included. Perhaps the TTT will lessen Sky’s train effect in the mountains, but it might well not as Sky seem uniquely able to turn classics-style riders into those capable in the mountains as well as on the flat. Either way, the time gained/lost in the TTT will have a profound effect on the race and may even be the dominant factor, which I think would be a huge shame. Yes, it is partly a team sport, but it’s also partly an individual sport and seeing a rider win a race largely because he belongs to a rich team who are consequently very good in the TTT is not very satisfying (see this year’s Dauphine). Most other GC teams don’t have this strength in TTTs – probably only BMC and Mitchelton-Scott to finish within a minute of Sky’s time? Having said that, only Movistar would be daft enough to have lost Castroviejo and Dowsett in this of all years without replacing them. How many TdFs are they willing to lose on flat stages before it sinks in that you can’t just fill a team with climbers? I still think Froome will win. Whatever the preparation used is, it works and this course suits him a great deal: strong team for the TTT, he’s good on the cobbles and he’s got that final ITT to bank on. If riders want to beat him, they’re going to have to attack him early and hard if he has bad days. They didn’t do that in the Giro, allowing him to come back on certain days, and then regretted it. After the TTT the race for overall will be 85% over. At least the cobbles look interesting. I think BMC will win the TTT and there won’t be much between them and Sky much as in the last TTT in the Tour. The losers in the TTT are Bardet, Nibali and Dan Martin. Another advantage for Froome is that – as is normal in the Tour – there are plenty of flat days at the start where he can get a fair amount of rest. It’s not like the Giro where there were big climbs early in the race. The 3-2-1 Bonus seconds: Has this ever been done before? Looks to be new to the Tour, but any other history in other races/eras? I can see there are no points associated with it, and assume there’s no cash bonus either. Will it be a non-feature – neutralised by non GC riders? Will GC riders take any interest? It’s not really going to be of any interest to anyone else, is it? Having thought some more, it could provide an opportunity for an otherwise no chance rider/break away specialist to get to wear the yellow jersey… although hard with the finish line bonuses. 4 days in the break, and no sprinter winning more than once…. so maybe not. As I’ll be away until 15th I’m quite pleased the first 8 stages look completely missable. Can watch the last 1km on YouTube and that’ll be it. Almost 2 whole weekends squandered again by ASO. Love it when the “experts” predict nothing is going to happen! usually means tune in and watch intently. Lack of MTF really hurting here. Glad this is the first Tour in years i’ll be forced to miss. Expecting a more allround than pure climby winner. So Porte, basically. I’d argue it’s one of the best routes ever on paper, a lot going on in the mountains with some hard climbs and surprises along the way compared to the predictable ski station summit finishes of the past. But up to the riders as ever to exploit it. I’d argue, that you’re right, but I’m almost always let down by non-MTF finishes. It does however usually lead to smaller gaps, which with some riders here (say, Dumoulin) could make it really, really exciting. I’m liking stage 5 and the cobbles. Springtime in Summer! If memory serves the last time we had some tough cobble type staged we ended up the yellow and green off the front smashing it up! Personally I think throwing some cobbles into the race is a great idea, the GC winner should be the best across all surfaces. Shame in a way they didn’t leave the gravel at the top of one of the climbs, a little like the Giro. Speaking of the Giro, it’s going to be tough for the TdF to beat the Giro, the recent edition was probably one of the most exciting GTs for a very long time. There’s gravel this time, both on the Plateau de Glières and apparently at the top of the Col du Portet. But both are short and won’t change much beyond a bit of dust. Is it just me, but the thought that the entire parcours has been “anti’Sagan”-ised comes to mind? Plenty for the out-and-out sprinters, but much less for the likes of Sagan and Matthews. Of course, Sagan is capable of competing in the sprints but the battle for the Green Jersey looks not dissimilar to last year’s contest in that Matthews had to go long-range hunting for any points. It wasn’t the time limit that eliminated Kittel last year. He crashed and abandoned before the end of the stage. INRNG’s traditional series of posts before the tour feel like the countdown to Christmas, roll on the “Who will win the Yellow/Green/Polka Dot/White jersey” posts! As usual the first week looks like a snoozefest. I’m sure something interesting will happen at some point but it looks to be very weather dependant. I think the most interesting thing about this year’s tour isn’t the route but the Movistar situation. Along with Froome I think Quintana will be the least satisfied of the favourites with another podium. He looked good in Switzerland and won’t be afraid to go long if needed. It will also be interesting to see how other teams back there leader. Its taken several years but at last it looks like BMC will get behind Porte 100% (if Van Avermaet’s & Van Garderen’s assistance last week is anything to go by). I’m also looking how much LottoNL-Jumbo get behind Roglic. BTW the latter is my pick for a genuine upset win. I think Quick Step are going to have a field day. 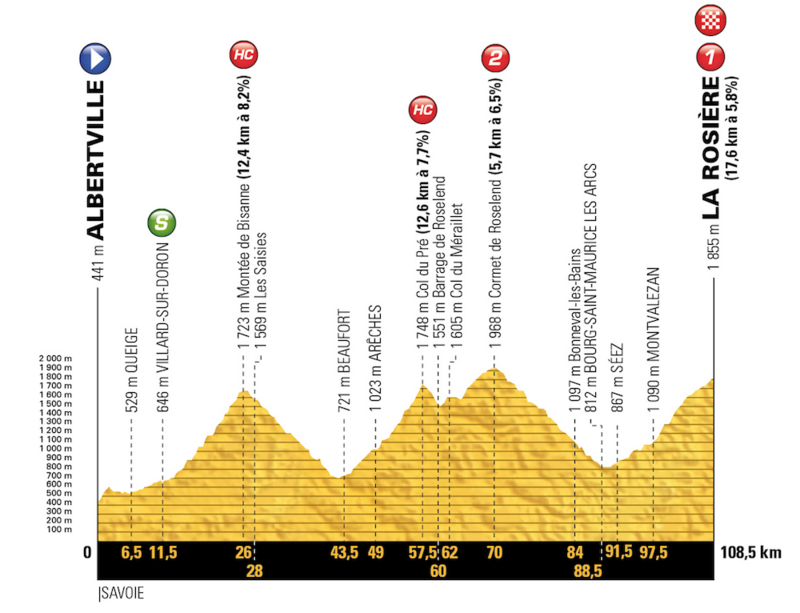 I sort of think that Jungels or Alaphillipe might fair well until the mountains. That Brittany stage could be magnificent with the right conditions. When the same guy wins year after year, it’s easy to blame LeTour for becoming formulaic. And perhaps it is, but I can hope for some change with the obvious favorite fatigued by the Giro while others will arrive fresh. Everyone knows the formula but only a few seem to be able to replicate success at it year after year. At this point I’m in the “Anybody but Froome/SKY!” camp. Anybody, though I hope to see Nibali up there making things interesting even if he doesn’t manage to win another Grand Boucle. Over the past few years – during Froome’s TdF dominance – I’d suggest that routes have not been so formulaic but rather changed up each year in order to try to lessen his chances of winning without much contest. In particular by reducing the number of ITT kilometres (though this had little effect since he is in the top few in the world for both time-trialling and climbing), and also by additions variously of cobbles, downhill finishes, narrower, steeper climbs rather than the usual wide, gradual ski-station roads, etc. “At this point I’m in the “Anybody but Froome/SKY!” camp.” — at this point, Larry? You set up that camp some years ago and haven’t unzipped the tent flap or opened your mind to other options in the world since ;). Supporting particular riders is all well enough, though laughable when taken to blind excess, but wishing a certain rider not to do well is a poor contribution to sport in my view. The reduction in team size should really mix things up this time. Sky won’t be able to dominate so they will need to find other ways to win. I think you’ll all be purring about this edition by the end of July. That could be true if – and it’s a big ‘if’ going by experience – riders are willing to attack earlier. Only 3 stages end on big climbs: will people go for it on the last climbs in stages that end on a descent? Probably only if someone known as a weak descender is in the lead – of the GC contenders, by my reckoning, that’s Porte and Thomas, if you count him as a GC contender. Bad weather when? If during the early stages then the Movistar trident could be lost at sea during some QS echelons which Froome and Thomas are more capable of following. BMC and Sky could grind Movistar into the ground before they even get to the mountains when you add the TTT and cobbles. I hope they are still in it so we can see how their 3 (plus Soler) are thrown at the Sky mountain train! One example from this year’s Giro: the wet stage where he fell off his bike a couple of times and looked all over the shop. Doesn’t seem fond of the cold either. I agree with you about Movistar – floundering on the flat seems a speciality, especially if you add wind, cobbles, a load of mountain goats in a TTT… they could easily be out of it before the mountains are reached. So Sky will only have 6 other guys to park behind Kiryenka and ahead of Froome instead of 7? We’ll see if the reduction has any noticeable effect come Paris. While everyone is entitled to their view, you are incorrect about my thoughts on Froome. While I’ve never liked him, I’ve not been keen on any of the other “mow ’em down in the chrono, defend in the mountains” contenders (though I do admit Froome has now flipped the script on this at the Giro) either. But now with his salbutamol fiasco and the rest of the revelations of hypocrisy and dodgy dealings with SKY, I truly want anybody but Froome/SKY to win Le Grand Boucle. I hated Dumoulin’s win at Giro 2017 for example, but in 2018 I’d be thrilled to see him on the top step of the Tour (or Giro) podium if that means Froome’s not there. If Froome falls out of contention for some reason I’ll go back to wanting to see Nibali or Quintana on the top step over the likes of BigTom, but this far out I’m “Anybody but Froome/SKY!”. You may think that’s somehow unfair, but the popularity of this sport back in the golden age has a lot to do with heroes and villains, no? Coppi vs Bartali. Saronni vs Moser. LeMond vs Hinault. Anquetil vs Poulidor, etc. Larry, why would you prefer the Diesel Dutchman, One Speed Tom, to win? Is it because you feel he has the best chance to beat Froome? That doesn’t put much confidence in Vincenzo, Quintana and the rest. Is anyone else starting to feel that “mow ’em down in the chrono, defend in the mountains” is the new “Heine’s folly”? Larry sure likes to work from a script. RonDe, “mow em down in the crono, defend in the mountains” is very effective but more important to me it’s BORING. I’ve always hated it, even when LeMond did it. But I’d rather be bored than see Froome win again. As a complete amateur who only started watching cycling seriously last year, this is a wonderful site, and I am enjoying the insight and viewpoints expressed here immensely. Thank you Inner Ring, whomsoever you may be. But I must agree with you Duncan: wishing a certain rider/team not to do well is a very very poor contribution to sport!!! It certainly detracts from the “credibility” of the writer´s comments. If all he wants out of the TdF is that Froome/Sky don´t win…why on earth is he following it? For many, hoping that Froome/Sky don’t win isn’t some arbitrary dislike, but is based on them thinking that they/he are cheating, which is based on what we’ve all heard about Sky and Froome failing a drug test. Admittedly, their relentless hubris about how clean they are over many years hasn’t helped. Many of us also have long experience of doping issues in cycling and thus lack faith in the authorities dealing with this fairly and objectively. ABX – Anyone But X (fill in your name of choice) has a long and valid history in sports. Hell, I virtually grew up on it in football. It’s nearly 20 years since I was desperately supporting tainted figures like Pantani and Ullrich against Armstrong. You know things are going badly when you’re hoping that Joseba Beloki will win the Tour. All this to say that although I disagree with Larry about who I want to win, I totally respect and defend his right to his position. He argues it in a reasonable fashion, and he accepts that it’s just his personal view, not some undeniable truth. On a side note, my biggest fear for this tour is the risk of people on the roadside throwing pee or doing worse as Froome rides by. It’s the way that Hinault appears to be stoking a fire with his calls for a strike that worries me. The French commentators during the Giro were also very negative about his performance. It feels like the whole of the country (or the cycling community at least) is taking personal offence at Froome and Sky daring to show up. In short, it could all kick off, and Bernard is adding to it. You may think I’ve tied myself in logical knots with this comment (defending one and criticising another), but I don’t think ‘Larry’ posting a comment on a blog is really comparable with the Badger having a friendly interview with a French newspaper that is then reported globally. Stages 5 and 6 look like great racing stages and with the B points, is it right that there is 3-2-1 seconds up for grabs plus normal finish line bonuses.., so 13 seconds per stage? That’ll keep it interesting. It’s been ages since we had such an interesting TdF (at least on paper). So hard to predict who this route is best suited for, but I have a sneaky feeling someone like Nibali will be relishing stages 5 and 9. 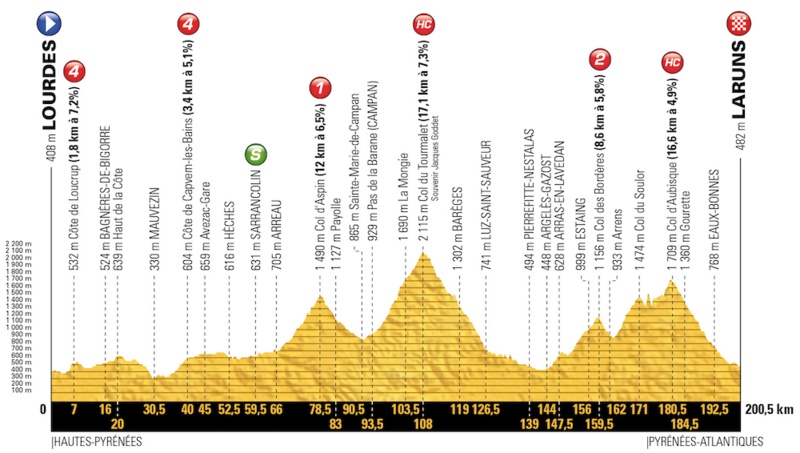 Some of the pure climbers will probably be all but out of it by the time we actually get close to any mountains. I think that first week will prove anything but a snoozefest, by the way. There are so many top riders, both sprinters and those with GC ambitions, that it will be nervous as hell, and I expect plenty of drama (hopefully no or few crashes though) because of it. Like Alastair S, I reckon Roglic could provide a GC shock. Don’t think he’ll win it – climbing isn’t quite up there with the best – but he can do a mean time trial and he’s proved himself recently in one-week stage races so it’s the natural next step for him, although admittedly a big one. 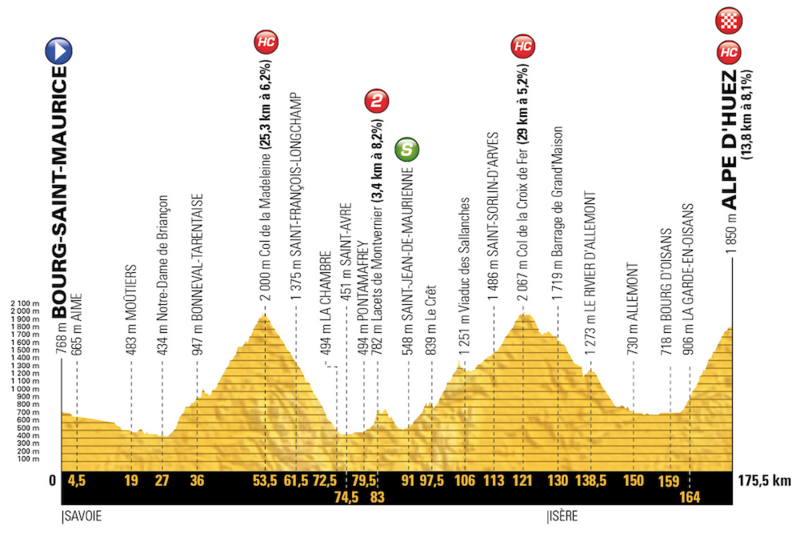 Will be on Alpe D’Huez for stage 12 – cant wait! Any recommendations for a bend etc to stake out a good viewing spot? That’s it, it was the same in 2011 and when Vuillermoz won in 2015. The first week in the 1990s would have been flat and featureless, seven sprints in a row. 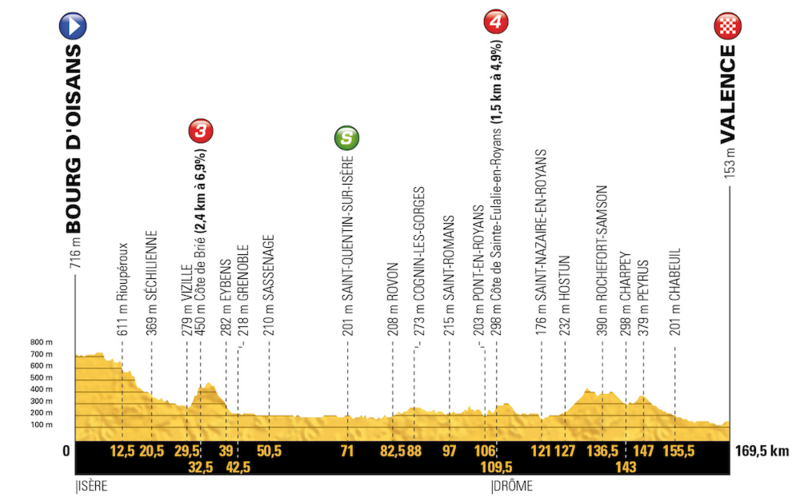 This year there’s the Finistère stage, the two ascents at Mûr de Bretagne and the cobbles so it should be more varied. 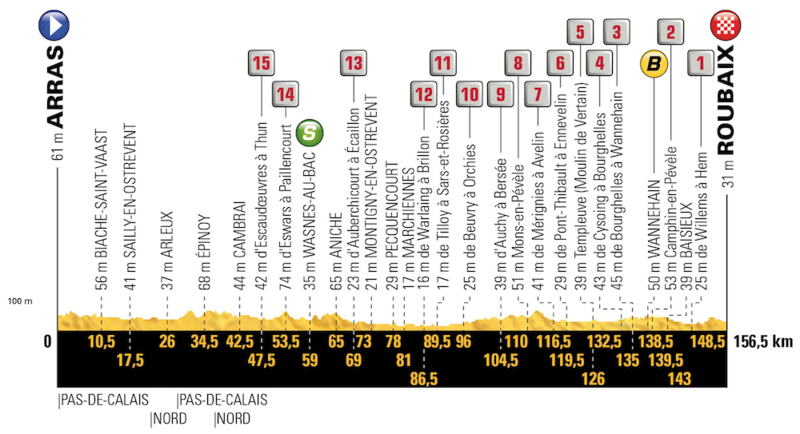 So big question for me is which cobbled section I should watch stage 9 on. One only. Long drive the day before so double heading. Ideal is a large TV at least 1km long and 4 or 5 stars.